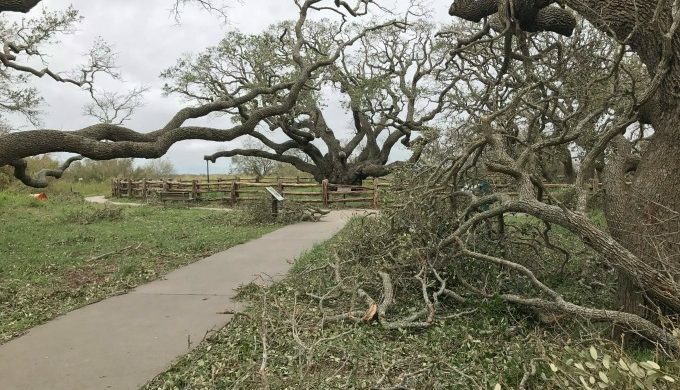 After the sobering results of Hurricane Harvey’s impact on Rockport became apparent in the early morning hours of Saturday, August 26, many began to worry about the fate of Rockport’s Goose Island State Park’s famous oak tree. 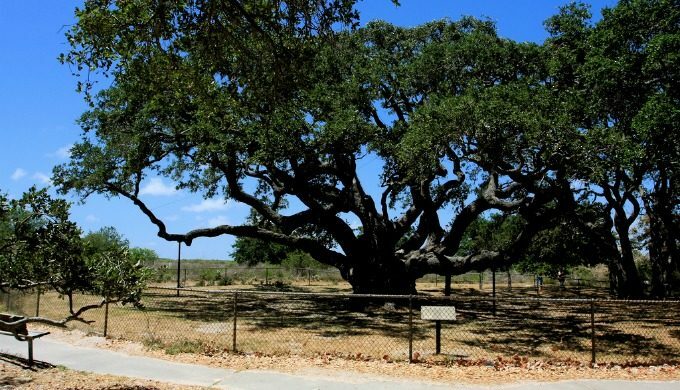 Estimated to be over 1,000 years old, the oak is the centerpiece of this coastal park. 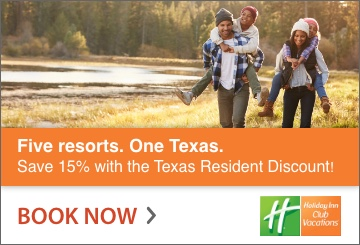 Nicknamed (rightfully so,) “The Big Tree,” the oak is one of the largest live oak trees in Texas, and in the nation. Hurricane Harvey came ashore taking a direct hit to the Rockport area. Leaving a path of destruction in its wake and many homes – from modest fishing shacks to opulent vacation homes–decimated. As dawn broke over Rockport on Saturday, shedding light on the aftermath, we began to get our first glimpses of the outcome of the storm. Boasting a trunk circumferences of over 35 feet and a height of over 44 feet, was it possible that “The Big Tree” could survive the impact of a Category 4 storm with wind speeds of 130 mph? Luckily, the answer is yes. The tree is, by most accounts, in good shape after the storm. Goose Island State Park reports than many of the younger oak trees around it have fallen, but that “The Big Tree” is still standing. “The Big Tree” has a storied and checkered past. It has allegedly been a hanging tree, a pirate’s rendezvous, and even a ceremonial site for the cannibalistic Karankawa Indians. The unusual branching pattern of the tree is a result of the near-continuous gulf breeze. 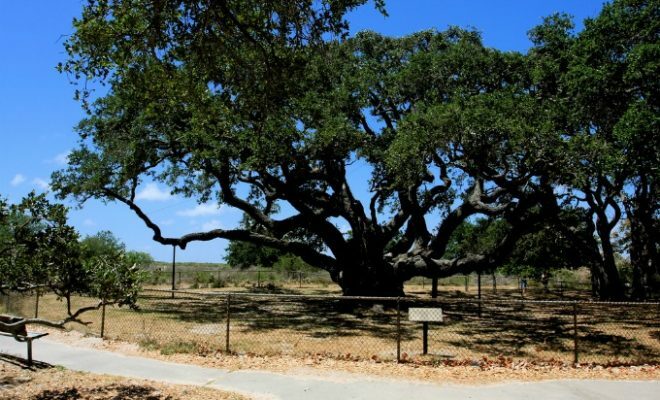 According to the National Wildlife Federation, wood from live oaks is incredibly sturdy and durable. The naval vessel USS Constitution was nicknamed “Old Ironsides” after her live oak hull survived repeated cannon fire during the War of 1812. Perhaps this explains “The Big Tree’s” tenacity in the face of thousands of years of hurricanes.